The following is a Blogging for Books book review from my husband. 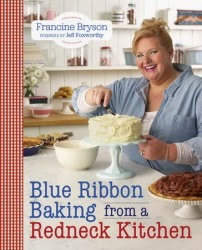 Blue Ribbon Baking from a Redneck Kitchen by Francine Bryson is a must have in any baker's kitchen. I ordered this book hoping her recipes used in The American Baking Competition, especially her chocolate bacon peanut butter pie, were in here. To my great joy they all were. I like to look through cookbooks for ideas but rarely do I ever sit and read a cookbook for enjoyment. This book is more than just a cookbook. Beside all of the creative mouth-watering recipes from the show she offers many other decadent originals, old family favorites and plenty of entertaining stories of her life. If you are on a diet or ever want to be you should not buy this book. However if you want to treat yourself and loved ones to desserts that add inches to your waist by merely smelling them this is the book for you. In my opinion this book is a necessity were ever a sweet tooth resides. Disclaimer: This book was provided as part of the Blogging for Books program. All opinions stated here are either my own or those of my family.